LEGO and Batman? Together?! Yes, that’s right. LEGO Batman is here and he will never go out of style. But if you’ve ever tried to find LEGO Batman themed decorations, gifts, games, and even invitations, you know it’s not easy. Luckily, if you’ve got a splash of imagination, a pinch of know-how, a trusty Batman symbol, and access to internet printables, you’ve got all you need! Every superhero has its beginnings in a comic book. So, you can always go the “comic book action hero” route with some action words like “POW” or “WHAM” displayed tastefully along the walls. You could even build these words with LEGOs to bring the two worlds together. Cut out miniature cardboard buildings that can be placed along the wall to look like Gotham city is in your own home. As you may have guessed, anything relating to bats goes with this theme. So find some fake bats in your old Halloween decorations, or borrow some from a friendly neighbor. For the drinks, purchase some yellow disposable cups and attach some cut-out black Batman symbols to the exterior for instant workability. Add some more LEGO flare by taking empty baby food jars and painting them to look like the heads of a LEGO Batman figure. You can place these just about anywhere with a flat surface. This can go one of two ways. The first option is to save time and effort by using pre-made batman cupcake liners, dying white cake dark blue, and topping the cupcakes with yellow frosting and bat sprinkles. The second option is to have a cake made, starring the blue, black, white, silver, and yellow color palette, using the simple block appearance of a lego, and finished off with the Batman symbol. If you’re feeling extra talented, you can even try your hand at doing it yourself. Create food based around the Batman characters, good and bad. “Joker Juice” can be some sort of fruity punch. “Poison Ivy Produce” is a great name to use for a veggie tray. Get a list of the characters, decide what kinds of food you’d like to serve and see if you can match the two lists! And don’t forget to set out some bowls of hard candy LEGO bricks. Those cute, delicious creations are kid magnets. This one is just as it sounds. Let each child choose which side they want to be a part of, set physical boundaries, and let their imaginations run wild. You can even set an objective, almost like capture the flag. Place a small Batman action figure in a 9 x 13 baking sheet. Fill the baking sheet with water and freeze it. Then, hand out squirt guns to all the kids to use in an effort to unfreeze Batman as fast as they can. You can even make two teams and see which team can unfreeze Batman first. Set out a substantial amount of LEGOs for kids to use to build their own version of Gotham city. This game has the potential to keep the kids occupied for hours. If the weather looks good, set up a blow up obstacle course outside. Kids will feel as invincible as a superhero, jumping and bouncing higher than ever before, racing their friends to the finish line. Using the infamous Batman color palette mentioned before and those same comic book phrases, get creative and get messy. You can make the back of the invitation look like a giant LEGO. Not feeling creative? There are tons of printables available to you on the internet. Find one you like, plug in your details, and get printing! 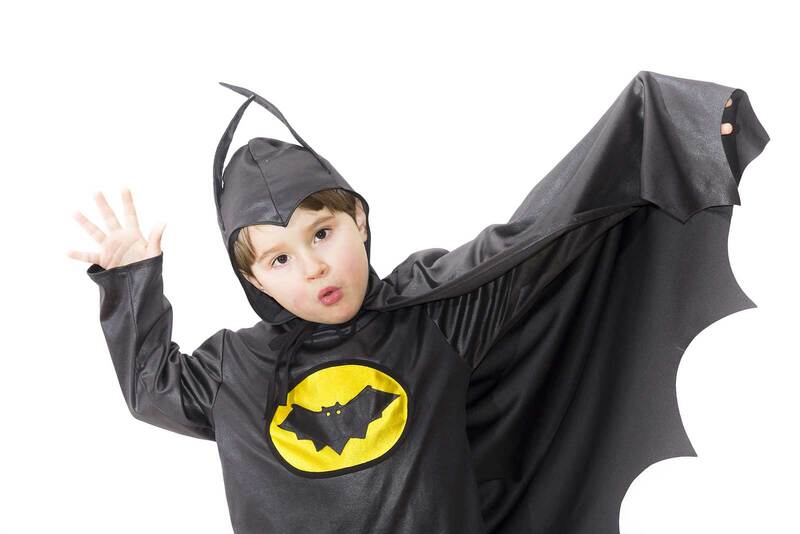 Make every child feel like a superhero by including gift bag items such as a bat mask and a super hero cape. Add in a few stickers, some candy, and some plastic bling for a complete take-home goodie bag they’ll be sure to love. Make your little superhero feel extra special this birthday with a theme everyone will love–LEGO Batman. He’s heroic, he’s goofy, he’s a welcome twist on an old favorite. Stick to the color palette, use the Batman symbol over and over again, throw some old LEGO toys around the room and “BLAM” you’ve got yourself a party, my friend. Just make sure to wear shoes. Those suckers hurt! Looking for more great party tips? We’ve got a whole section of kids birthday party tips and tricks. Looking for the simplest way to throw a birthday party for your kid? Than book one of our quick, easy and simple to plan party packages.